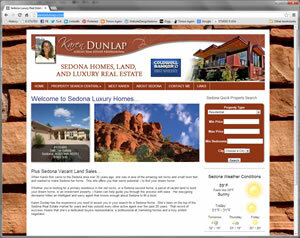 Selling Sedona luxury real estate for over 28 years has been a great experience for me. When it comes to representing luxury real estate, choosing the proper real estate agent is important. I pride myself in having a team of real estate professionals to help me in servicing my clients in any way possible. Taking luxury real estate to the next level is what we are all about. Working with a team of marketing specialist and digital imaging providers, I am able to free up more time to spend with my clients. When you really want an agent who is focused and dedicated to their work, I believe there is no other choice. I truly love what I do. Karen came to the Southwest 31 years ago to attend Northern Arizona University and has been in the real estate business for 22 years, 19 of those in Sedona gaining the level of market knowledge and expertise that clients expect from their REALTOR®. The many awards Karen has earned attest to her success: 3-time Coldwell Banker Top Producer; 2004 International President’s Premier; 2003 President Elite; 2002 President Circle. In addition Karen is a founding member of the Sedona Luxury Real Estate Professionals, chairman of the MLS Fair Housing Committee for the past 13 years and continues to teach the fair housing principles at new agent orientations. You can view Karen’s listings on this page and on this website. Or call her for a complete information package. Buying, selling or just investing in Sedona real estate… Karen approaches each transaction with energy, enthusiasm and experience. Karen truly loves what she is doing.